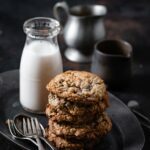 Easy Chocolate Truffle Oatmeal Cookie Recipe. Big soft oatmeal cookies full of chocolate truffle chunks. In a medium bowl whisk together flour, salt, baking soda, cornstarch, and cinnamon. Then stir in oats. Set aside. In bowl of stand mixer fitted with paddle attachment, beat together butter and sugars. Add vanilla, and eggs one at a time. Scrape bottom and sides of bowl as needed. Slowly spoon in flour and oats until dough is formed. Take a small spatula and scrape dough from paddle. Stir in chopped chocolates and chocolate truffles with a wooden spoon. Cover bowl with plastic wrap and set in fridge to chill for 30 minutes. Preheat Oven to 375 F and line two cookie sheets with parchment paper. Using an ice cream scoop or 2 Tbsp Scoop, measure out cookie dough. Scoop cookie dough balls and place on baking sheets 2 inches apart. Bake on middle rack for 10-12 minutes. Let cookies cool on pan for 3-4 minutes, then transfer to cooling rack. Eat warm with glass of milk! !